Adafruit Holiday Gift Guide 2012 – Arduino Shields « Adafruit Industries – Makers, hackers, artists, designers and engineers! Gobble Gobble day is this week, which means the hotly anticipated (by us!) and dreaded (by you!) holiday shopping season is beginning. Luckily for you we’re making it easier this year with our 2012 Adafruit Gift Guide series. Each day until Christmas we’ll roll out a different theme, everything from wearable electronics to Arduino shields, from 3D printers to photography to gift certificates from sites Adafruit likes! Here are a few of my favorite Arduino Shields. If you are building a wish list, or are looking for a good gift for an Arduino fan, you can’t go wrong with these. Adafruit 1.8″ 18-bit Color TFT Shield w/microSD and Joystick – This lovely little shield is the best way to add a small, colorful and bright display to any project. We took our popular 1.8″ TFT breakout board and remixed it into an Arduino shield complete with microSD card slot and a 5-way joystick navigation switch (with a nice plastic knob)! Since the display uses only 4 pins to communicate and has its own pixel-addressable frame buffer, it can be used easily to add a display & interface without exhausting the memory or pins. 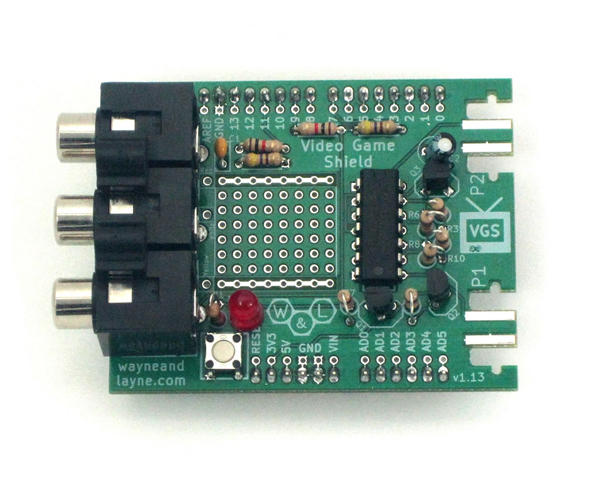 Wayne & Layne’s Video Game Shield Kit – The Video Game Shield is an Arduino add-on shield to make your own video games, including graphics, text, sound effects, and music! Using the power of open source, this Shield includes everything you need to make awesome black-and-white video games on your TV. It supports up to two Nintendo Wii Nunchuck controllers for an easy and familiar interface. Arduino WiFi Shield – The Arduino WiFi Shield connects your Arduino to the internet wirelessly. Connect it to your wireless network by following a few simple instructions and start controlling your world through the internet. 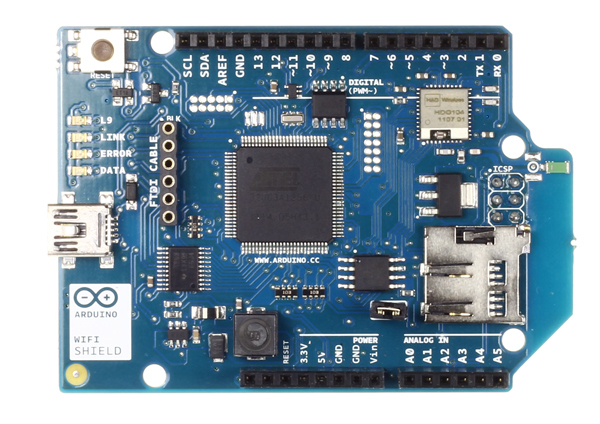 As always with Arduino, every element of the platform – hardware, software and documentation – is freely available and open-source. This means you can learn exactly how it’s made and use its design as the starting point for your own circuits. Adafruit PN532 NFC/RFID Controller Shield for Arduino + Extras – We’ve taken our popular Adafruit PN532 breakout board and turned it into a shield – the perfect tool for any 13.56MHz RFID or NFC application. 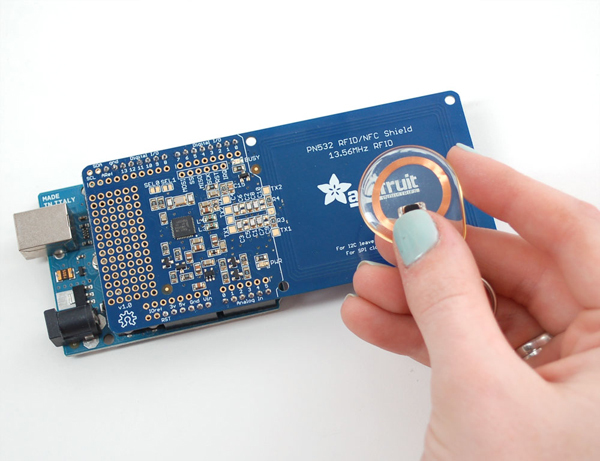 The Adafruit NFC shield uses the PN532 chip-set (the most popular NFC chip on the market) and is what is embedded in pretty much every phone or device that does NFC. It can pretty much do it all, such as read and write to tags and cards, communicate with phones (say for payment processing), and ‘act’ like a NFC tag. If you want to do any sort of embedded NFC work, this is the chip you’ll want to use! 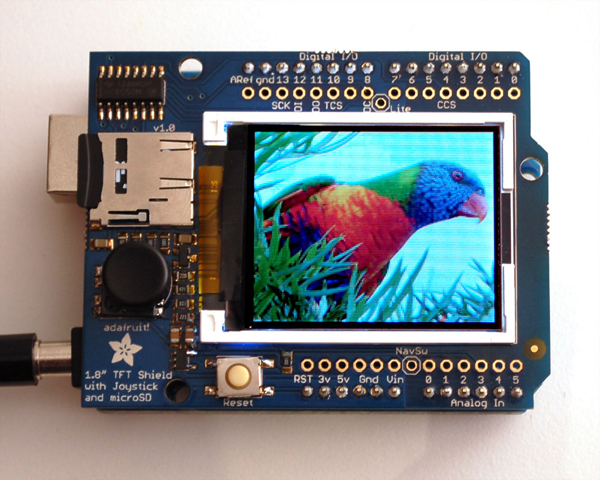 RGB LCD Shield Kit w/ 16×2 Character Display – Only 2 pins used! 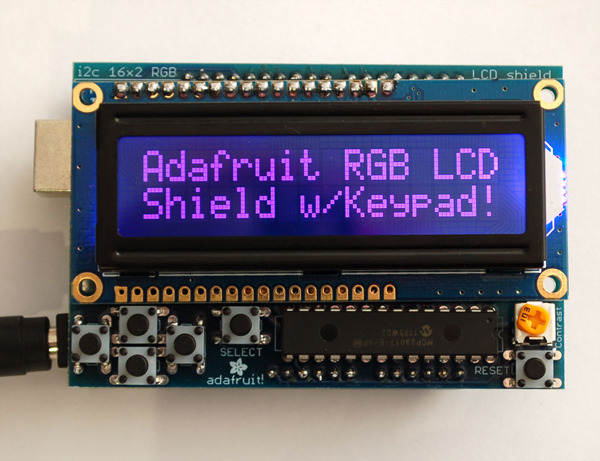 – This new Adafruit shield makes it easy to use a 16×2 Character LCD. We really like both the RGB positive and RGB negative LCDs that we stock in the shop. Unfortunately, these LCDs do require quite a few digital pins; 6 to control the LCD and then another 3 to control the RGB backlight for a total of 9 pins. That’s half of the pins available on a classic Arduino! 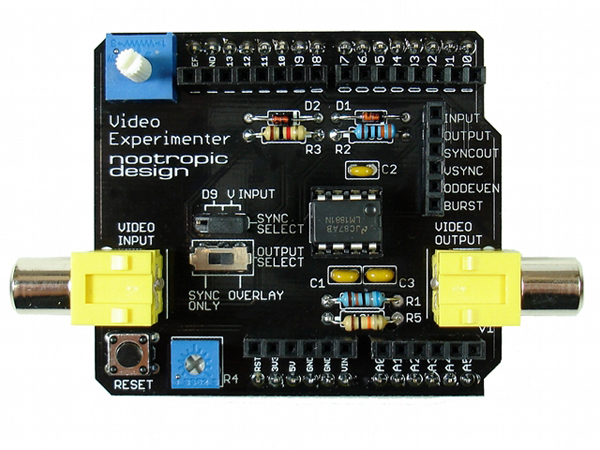 Nootropic Design Video Experimenter Shield – an Arduino shield that lets you do all kinds of experiments with video. Overlay text and graphics onto a video signal from a camera, DVR, DVD player, VCR or any other source of composite video. Capture low-res video image frames for display or video processing. Give your Arduino the gift of sight! Perform object detection for computer vision projects. Decode NTSC closed captioning or XDS (extended data services) data embedded in television broadcasts. Works with NTSC (North America, parts of South America and Asia) or PAL (most of the rest of the world) television standards. For more info on what TV standards see the map here and this list of countries and their standards. Here are your 2012 shipping deadlines for ordering from Adafruit. Please review our shipping section if you have specific questions on how and where we ship worldwide for this holiday season. UPS ground (USA orders): Place orders by Friday 11am ET – December 14, 2012 – Arrive by 12/24/2012 or sooner. UPS 3-day (USA orders): Place orders by Wednesday 11am ET – December 19, 2012 – Arrive on 12/24/2012. UPS 2-day (USA orders): Place orders by Thursday 11am ET – December 20, 2012 – Arrive on 12/24/2012. UPS overnight (USA orders): Place orders by Friday 11am ET – December 21, 2012 – Arrive on 12/24/2012. UPS International: Place orders by Monday 11am ET – December 17, 2012. Can take up extra time due to worldwide delays and customs. Should arrive by 12/24/2012 or sooner. Tuesday, Dec. 25, 2012, Christmas, no UPS pickup or delivery service. Tuesday, Jan. 1, 2013, New Year’s Day, no UPS pickup or delivery service. United States Postal Service, First Class and Priority (USA orders): Place orders by Friday – December 14, 2012 – Arrive by 12/24/2012 or sooner. USPS First class mail international (International orders): Place orders by Friday – November 23, 2012. Can take up to 30 days ore more with worldwide delays and customs. Should arrive by 12/24/2012 or sooner, but not a trackable service cannot be guaranteed to arrive by 12/24/12. USPS Express mail international(International orders): Place orders by Friday – December 14, 2012. Can take up to 15 days or more with worldwide delays and customs. Should arrive by 12/24/2012 or sooner.